Healthy Mac & Cheese – two ways! 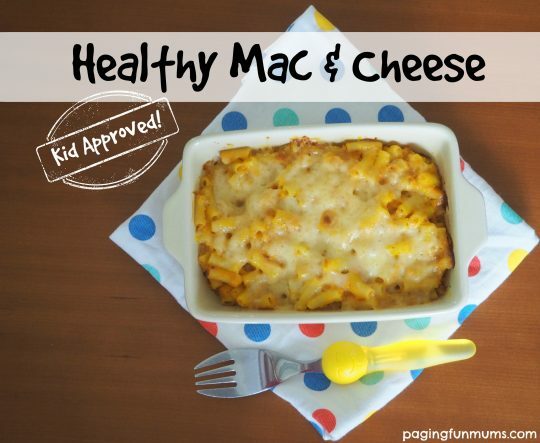 This healthy Mac & Cheese recipe is so yummy! My whole family LOVES it. I got the inspiration from one of our favourite food blogging websites – Super Healthy Kids, if you aren’t already following them on Facebook you should jump on and do that here! You can find their recipe here as well as HEAPS of wonderful meal ideas and planners! I was multitasking this past weekend and batch cooked several pumpkin and ricotta recipes for my freezer (watch this space for all the other recipes). So I decided to make a healthy Roasted Pumpkin Mac & Cheese AND also some Healthy Mac & Cheese Muffins too…best idea EVER! These muffins make the perfect lunchbox filler and they freeze really well too – winning! Pre-heat oven to 200 degrees Celsius. Placed pumpkin on a lined baking tray with a light coating of oil and roast until tender (aprox 15 mins). While the pumpkin is roasting cook your macaroni pasta per the packet directions. Saute your onion until translucent and soft, I sautéed my onion in a pan with some olive oil but you could simply add it to the pumpkin in the oven (as I mentioned I was multitasking so I needed sautéed onion for some other recipes). Place your roasted pumpkin and onion & ricotta into a food processor and whiz it up to make a creamy puree. Combine your cooked pasta with the puree and grated cheese. Place the mixture into individual ramekins and bake for just a few minutes, to form a light crust on top. I made four ramekins but could have made 6 with this mixture (I kept the remaining mixture to make the muffins below). 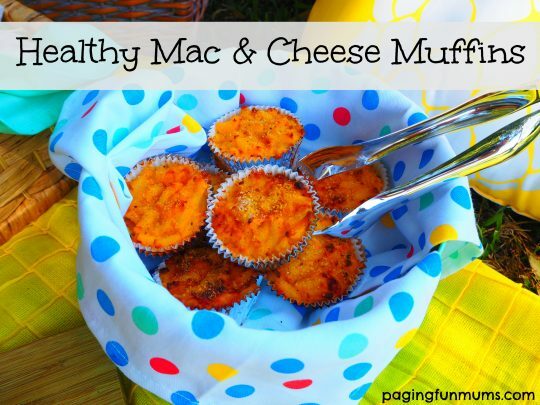 Healthy Mac & Cheese Muffins! These muffins are such a clever way to use up extra Mac & Cheese, especially the healthy version above! They are delicious served warm or cold, making them ideal for picnics and lunch boxes. Pre-heat oven to 200 degrees Celsius. Place all the ingredients in a bowl and mix until fully combined then spoon mixture into muffin liners. Bake for 15 mins or until lightly golden on top. If you like a crisp crust on top, sprinkle with some extra breadcrumbs before baking. This made 9 muffins, next time I will make a double batch of the above recipe to make more! I freeze these in individual freezer bags so i can quickly grab them easily for my children’s lunchbox. I hope you and your family enjoy this recipe as much as mine do! You might also enjoy some of the family meal ideas found here. « Launch of the NEW Weet-Bix Cookbook – and we’re in it! Could I please subscribe to your healthy recipes for kids site? My kids are all adults now, but I love baking WITH (not just FOR!) my 10 wonderful grandchildren ages 4 months to 16 yesrs! Every single one if them is a treat!! And if this recipe ( well 2 recipes actually!) are any indication, what we prepare together will also have great nutrition, so their parents will be happy too! !